SOCCEROOS striker Tim Cahill is not fussed about the defensive lapses his team showed in its 3-2 win over Saudi Arabia in London, instead maintaining Australia needs to continue its ruthless attacking streak. Cahill - Australia's greatest-ever goal-scorer - pounced in just the second minute, while skipper Mile Jedinak and Bailey Wright also got on the scoresheet. But it was another match without a clean sheet for Ange Postecoglou's side, allowing the Saudis back into the contest late. 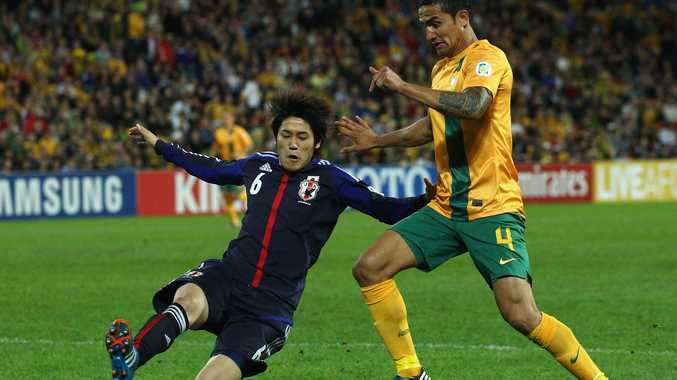 The Socceroos conceded nine goals in three World Cup defeats earlier this year. "Our mentality this week has been 'how are we going to take our football forward and how are we going to progress?'" Cahill told Fox Sports. "The goals came and obviously at the end we conceded a few goals, but we're not worried about conceding goals. We're more worried about the intent for us to play because we've got the Asian Cup in January when we need to be ready." Postecoglou again put faith in his youngsters, handing Wright his debut, while Josh Brillante and Massimo Luongo started in midfield, the latter a standout in the No.10 role. Brad Smith also got another chance on the left for the last 30 minutes, while Western Sydney Wanderers FC striker Tomi Juric did well in his 20-minute cameo. "You can see progression and I know it's hard for people to get up in the early hours of the morning and think we're going to win 5-0, but the icing on the cake is going to be in Australia (for the Asian Cup)," Cahill said.